If you’re looking for a cool toy or gift for a kid then you’ll love these toy chainsaws, and the best part is they won’t cause any harm but will surely guarantee a large dose of fun and play for your child. I don’t know what it is about a toy chainsaw but they’re somewhat special and different than a lot of toys out in the world. These are the type of toys that will spur some curiosity in a child about the great outdoors — nature and trees. It’s important to get children interested in learning how to interact with the world while developing their motor skills. Kids love to mimic mom and dad using a chainsaw around the house. Just keep your kids away from your real chainsaw. Keep it locked away somewhere safe. What’s the Best Toy Chainsaw? Because of my own passion for encouraging kids to play outside, I created a new section on Chainsaw Journal called Outdoor Kids. You’ll find lots of outdoor related toys for kids, such as the Peg Perego John Deere Tractor or the Black and Decker Junior Power Tool Workshop or how about this great set of toy power tools for kids. Outdoor Kids will be updated on a regular basis and I’ll be writing lots of articles on cool products for kids. My goal is to get kids inspired to play outside on a regular basis, and use their imagination to create and explore their own potential. First and foremost, these toy chainsaws will be the envy of your child’s friends because I can almost guarantee that none of them have their own toy chainsaw. Some of these even have built-in sounds with rotating chains, lights and some vibrate. How cool is that? Too bad they can’t make real chainsaws as safe as these play toys. Hopefully one day they’ll figure out a futuristic chainsaw that can cut without risk of injury to the operator. Maybe a laser chainsaw. Who knows. See how adorable kids are when they get their hands on a toy chainsaw. The child in the video is playing with a STIHL kids chainsaw. But I digress. To be honest, I think even adults would think these are interesting, especially if you’re a chainsaw enthusiast. Another idea to consider is maybe you could use these as costume props, maybe even for Halloween. I think they’d be perfect for either a kid or an adult, depending on the outfit. So continue reading on as I detail seven fun toy chainsaws for children (or yourself). Maybe even some girls out there might trade one of their dolls for a toy chainsaw. That would be a fun video to make. Give a girl, expecting a doll as a gift, a chainsaw toy and film her reaction. I’m guessing she’d be quite perplexed. But if I had a child I’d do that just for fun, and then put it on YouTube. The most recommended toys from this list are the Husqvarna and the Black and Decker toy chainsaws. But don’t go on popularity, pick the one that looks the most interesting to you. It’s just a toy so no need to overanalyze it too much as you would do when buying a real chainsaw. Just buy the one that you think your child would love or better yet, just ask him or her. Before we move on, I want to tell you about a new section I’ve created on this site entitled “Outdoor Kids” which is a section purely focused on toys and other products that will inspire kids to become more active, inspired and engaged in the world around them. I’ve recently featured a couple of products that may spark your interest. The first one is the Black and Decker Junior Power Tool Workshop and next is the kids power tools and gardening set. There will lots more ideas to come so keep checking back for more. It may not cut a real oak tree but your child will love trying. This toy chainsaw is actually made by Husqvarna, and it’s special because it has a rotating chain and it looks like a miniature Husqvarna 440 chainsaw. The blade is made from rubber so nobody gets hurt. It also has built-in realistic sounds, which means it might drive you crazy if your child keeps it blasting all day. Just something to think about. As one would expect from Husqvarna, this is a well made toy chainsaw that can take a good beating, but it is plastic so don’t let your kid get too crazy with it. Also, I should mention that the pull-start handle doesn’t actually “pull” so keep that in mind. It meets all the required toy standards for the United States, which is to be expected from a great manufacturer. This is a very popular toy chainsaw on Amazon with plenty of positive reviews so peruse the comments section to find out more. 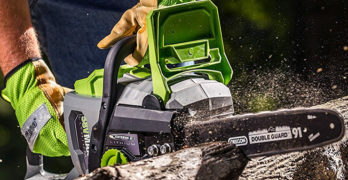 Also, I’ve included some Amazon customer comments for each saw within this article to give you a taste of what parents think about each chainsaw. After writing this article I decided to do a full review of this Husqvarna Toy Chainsaw, so if you want more information, you’ll probably want to read it. This is a beautifully made toy chainsaw that looks just like a real STIHL chainsaw, except it’s a toy. Kids will be drawn to the realistic noises and moving rubber chain. This is wonderful gift ideas for kids anytime of the year. A basic toy chainsaw. Not as nice as the STIHL or Husqvarna. The Black and Decker Junior Toy Chainsaw is another quality toy chainsaw, and like the majority of Black & Decker products, this toy is very well constructed. This also makes a chainsaw sound, but some customers complain about how loud it is. You may want your kid to keep this toy outside to prevent you from going insane, or if you live in a noisy household you might barely even notice. This is a very popular item on Amazon with lots of reviews for you to find out more about customers think about it. I rarely buy an item on Amazon that doesn’t have a decent amount of reviews, and I’m sure most people shop online with the same expectations. When deciding which toy chainsaw to buy, browse the reviews to learn more. I’ve included some customer feedback but there’s more if you visit the Amazon site. Play Right Playset: Comes with plastic tools as well. This Play Right toy chainsaw is a little different for a couple reasons. First, it comes with some plastic tools which include a wrench, screwdriver and 3 bits. Obviously these can be choking hazards so be careful about that. Another interesting feature is that it has lights that are place around the chain but unfortunately there’s no moving chain. Also it “revs and buzzes when you push the trigger.” It may not sound impressive to an adult but kids love flashing lights and moving parts on their toys. Bright, colorful and geared for younger children. A nice kids chainsaw overall. Theo Klein Bosch Chainsaw comes with hard hat and gloves. This Theo Klein toy chainsaw is fantastic. It’s very well made but smaller than the other saws on this list. The chain moves and also has built-in sounds and lights. It has it all. The cool feature of this toy set is that it comes with a hard hat and gloves to make your kid feel like a real logger. Whether these items fit or not will obviously depend on the size of your child but eventually he/she will grow into them. I like that they include batteries with this toy chainsaw. That’s not always the case. Nice little kids chainsaw. Tool Tech Chainsaw: This one has goggles. I couldn’t find much information on this particular toy chainsaw but the rubber chain moves when you push the trigger button on the handle. It also has sounds, lights and it vibrates. It’s a simple toy. Most of these toy chainsaws are similar with the main difference being how they look. The unique feature of the Tool Tech Powerized Chainsaw is the fact that it has goggles. Pretty cool. Just make sure they aren’t used in place of real safety goggles. They won’t protect your child from anything. Well, maybe rain. Looks like a fun toy chainsaw for a kid to play with so he or she can pretend to be cutting your furniture. Kids don’t always need the fanciest toys. They’re quite happy playing with dirt. At least I was when I was growing up. I think kids today expect a little more for entertainment than when I was a kid. This toy chainsaw is more than enough to fuel their imagination. Colorful and interactive toy chainsaw kit. The Poulan Wild Thing toy chainsaw is actually modeled after the real gas chainsaw called, oddly enough: Poulan Wild Thing. This one has a rotating chain, makes a chainsaw sound and comes with fancy gloves and helmet. This toy chainsaw is a little ‘funkier’ than the other ones as you can tell by its vibrant colors. It would be fun if you owned the real Wild Thing and your kid owned this toy. Or, if you already own the real Poulan Wild Thing saw, then this would be the perfect choice to buy for your child. Also, it comes with batteries so you won’t have to buy any. Always a nice bonus. The batteries on this toy chainsaw will last a lot longer than the batteries on any lithium-ion chainsaw. Sad but true. A cute red battery operated chainsaw. Rotating chain & chainsaw sounds. This red kids chainsaw is visually bold and striking and it actually looks like a toy, unlike some of the other kids chainsaws in this article. It’s a no-name brand product so you won’t find any information on it online. At least I didn’t, but customers tend to be happy with this toy. It has a rotating plastic chain and also makes realistic chainsaw sounds. Great for small kids. The recommended age is 3 years old and up. Unfortunately batteries are not included. A well-made toy chainsaw — and it comes with goggles. This Craftsman toy chainsaw looks realistic for a toy. It has a nice angular style to it which make it visually appealing but it also has some great features, like the moving plastic “chain,” which is very safe and won’t harm your child or your furniture around the home. Trust me, your child will be trying to cut everything and anything inside and outside of your house. The chainsaw is started with a slight pull on the pull-handle, which also activates a light and starts the realistic chainsaw sounds. You can see this in action in the video below. This toy chainsaw does come with goggles but they’re cheap and aren’t very comfortable so I wouldn’t put too much weight on the addition on these goggles when trying to decide which kids chainsaw to buy. I would still recommend either the Husqvarna toy chainsaw or the Black & Decker kids chainsaw but this is a worthy contender if you prefer the styling. Chain can be removed with the included tool or by hand. Moving plastic “chain,” with animated lights and realistic sounds. Tool Tech Chainsaw: My favorite because it’s blue. Note: Unfortunately this toy chainsaw is currently unavailable on Amazon. Hopefully they will get it back in stock, but they may not. I can’t seem to find other retailers who sell it. If you find another place to buy it online please let me know and I will update the information. Or if Amazon gets more stock then let me know as well. You can email me on my Contact page. This Tool Tech Motorized Chainsaw is (was) one of my favorite toy chainsaw of the bunch for a lot reasons. First, I love the look of it. It just looks interesting with its bold styling. I’m an artist and designer so I naturally gravitate towards things that are well designed and have personality. That’s my personal bias. l love the blue color. When’s the last time you saw a blue chainsaw? 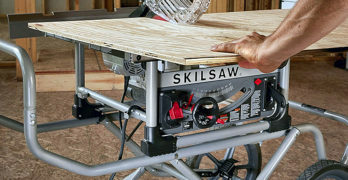 This is a unique saw on the outside but it has some nice features like the fact that the pull-start cord can actually be pulled and when you do it starts the engine. It has a an animated chain, with three different chainsaw sounds. Not to mention the fact it comes with safety goggles (not actual safety goggles, of course). Tool Tech is a brand from a company called Redbox, a toy manufacturer that’s been around since 1985. Either way, this is the most expensive of the toys on this list as well, but looks great and has a lot of great features. If I was a kid this is the toy chainsaw that I’d ask my parents for. Well, there you have it. A nice collection of toy chainsaws for kids. I’m sure a child would love any of these saws to spark their imagination. The simple act of pretending to cut stuff around the house seems to bring kids boundless joy. Kids love to play and run around and act like a grown-up. A toy chainsaw gives them a fun prop to roam around the home and yard with pretending their just like mom and dad. Consider the fact that most of these toy chainsaws make sounds which may or may not test your patience, but if you’re a parent I’m sure you’re accustomed to noise. I hope you found something of value in this article and if you decide to buy one of these toy chainsaws please send me a message on my contact page and let me know how you like it or send me some pictures with your child and his new chainsaw so I can publish it here at Chainsaw Journal.